Below is a complete list of all handheld vacuum reviews on Modern Castle. Click here to jump down the page to see how we review handheld vacuums, popular handheld vacuum brands (and their differences), and also how handheld vacuums work. All of these scoring factors are weighed differently. Their respective weights are determined based on what we believe to be the most important scoring factors (ie, cleaning performance is relatively more important than a simple return policy). We score each factor by compiling and analyzing a variety of objective data based and marry that data with our own subjective analysis on how the vacuum performed and compares to other vacuums. During each individual test we work hard to ensure we are properly documenting every step of the test. This helps to provide clearer measurements and analysis of the data. All of the factors listed above will be described in detail below, but for a more in-depth explanation of both our testing process and scoring factors please see our vacuum reviews page. Cleaning is a simple factor to test, but of the utmost importance. Handheld vacuums are designed to provide a quick fix for smaller spills and messes. Therefore, we tested just that. When testing the handheld vacuums, we use 3 different floor types; hardwood, low pile carpet, and high pile carpet. Each of these floor types are tested with 4 different debris types, including rice, kitty litter, cereal, and sugar. Just as the name suggests, we allow the handheld vacuum to clean up the various debris fields and measure how much the vacuum was able to pick up. After completing all 12 tests (4 debris types on 3 floor types), we compile a large data set and use this to determine the overall cleaning score for each handheld vacuum. The tests show the amount of debris the handheld vacuum cleaned up, by percentages. For example, if a handheld vacuum was able to remove 1.5 oz of rice from the initial 3 oz spread out across the floor, then this vacuums has cleaned up 50% of the mess. Once all of the cleaning tests are complete, we compare the results against other vacuums and analyze the vacuums relative performance. This then allows us to determine the final cleaning score for each handheld vacuum. How easy is it to use the vacuum on a day-to-day basis? How heavy is the vacuum? Is there a hose attached to the vacuum? Does the vacuum come with a crevice tool? Is the vacuum corded or cordless? If cordless, how long does the battery last before needing to be recharged? If corded, how long is the cord? How big is the dust bin? After answering these questions we are able to determine a final usability score. When talking about handheld vacuums, maneuverability is key. As a smaller unit, you can typically expect handhelds to move with ease. To that end, there are certainly handheld vacuums that could be too heavy, awkward to carry, or contain a shorter cord length, leading to inconvenient mobility. As a handheld vacuum, the maneuverability of the Eureka EasyClean is very portable and flexible. Each of these design components can positively or negatively impact how easily the vacuum is able to maneuver. When analyzing the maneuverability of a vacuum, we focus on a few main areas, such as weight, cord length, hose length (if applicable), nozzle length, nozzle height, and even suction power. Although the power may not seem like much of a maneuverability factor, it can have some effect on how well the vacuum is able to get into these tighter spaces and actually clean. Maintenance is not a game changer for handheld vacuums, but it is not an area that should not be overlooked. More often than not, the everyday user ignores maintenance when it comes to their vacuum. In order to ensure efficient functionality, user should be paying attention to the maintenance on a regular basis. That said, maintaining the vacuum should not be difficult, which is why we add it into our mix of scoring factors. How much time does it take to properly maintain the handheld vacuum? How much does it cost to maintenance the handheld vacuum? How Can You Score Value? To determine the value of a vacuum we look for the intersection between price and performance / quality. Vacuums to the left of the intersection are poor values. Vacuums to the right of the intersection are good or great values. However, handheld vacuums that are less expensive would be held to a lower performance and quality standard. A $30 handheld vacuum that achieves a 90% on its cleaning scores compared to a $200 handheld vacuum that achieves a 95% on its cleaning scores is a perfect example. The $30 handheld would most likely be considered the better value, as it is able to achieve good performance, while still being quite inexpensive. To pay an extra $170 for only 5% better cleaning performance isn’t a great value. Lastly, it is important to note that the value judgement is based off a variety of performance and quality attributes. We look at the combination of product attributes with respect to the price, which ultimately help us determine a more accurate value score. Is the company honest? Do they abide by their warranty terms and conditions? Are there any recorded frivolous lawsuits against consumers or lawsuits that could be considered anti-competitive? By scoring the company, we hope to provide a deeper insight into the company’s reputation and integrity. We also want to determine if they deserve you as a customer, or are there better companies out there for you to buy from? Ultimately, our company score tries to determine how trusted the company is. Scoring warranty is not the most interesting factor, but certainly worth taking into consideration. Comparing the warranties across the various handheld vacuums can help make a decision easier when it comes time to make the purchase, which is exactly why we believe it should be taken into account. What’s the length of the warranty? Are the warranty terms fair and reasonable? Does the company tend to honor their warranty? To determine the score we ask ourselves these questions, comparing the warranty for the respective handheld vacuum cleaner we’re analyzing. As with most products we review, we often consider how the above answers compare to other handheld vacuums and other vacuum cleaner reviews in general. Return policies are similar to warranties, with regards to scoring. It does not affect the performance of the vacuum, but it certainly make or break the shopping experience. When scoring returns, we use comparative assessment, just like with most of the other scoring metrics. How do the return policy terms and return length compare to other similar products? Return scoring is slightly tricky because the return policy varies from retailer to retailer. As a result, for returns we generally focus our analysis and scoring around the most popular and prominent retailer (in many cases Amazon.com, but there are others as well). We believe this helps to more fairly judge the return policy (as opposed to simply looking at the worst retailer that the product happens to be sold at). While handheld vacuums may not be the end-all-be-all vacuum for your home, they do make a great addition for most home vacuum cleaner setups. As a more convenient option for quick tidying up and small messes, handheld vacuums have become a good option for many people. Each of the brands listed below are some of the more popular brands. We will be reviewing vacuums from each of these companies and comparing them against one another. Bissell is known for creating quality floor cleaners, and lots of them. This company has a wide variety of vacuums, including handhelds, uprights, stick, and wet / dry. In addition to these vacuums, Bissell also sells mops, sweepers, and carpet cleaners. While they may not have as much depth in this area, the consistency among their handheld vacuum line allows user to purchase a lower end model and still receive a similar level of performance. 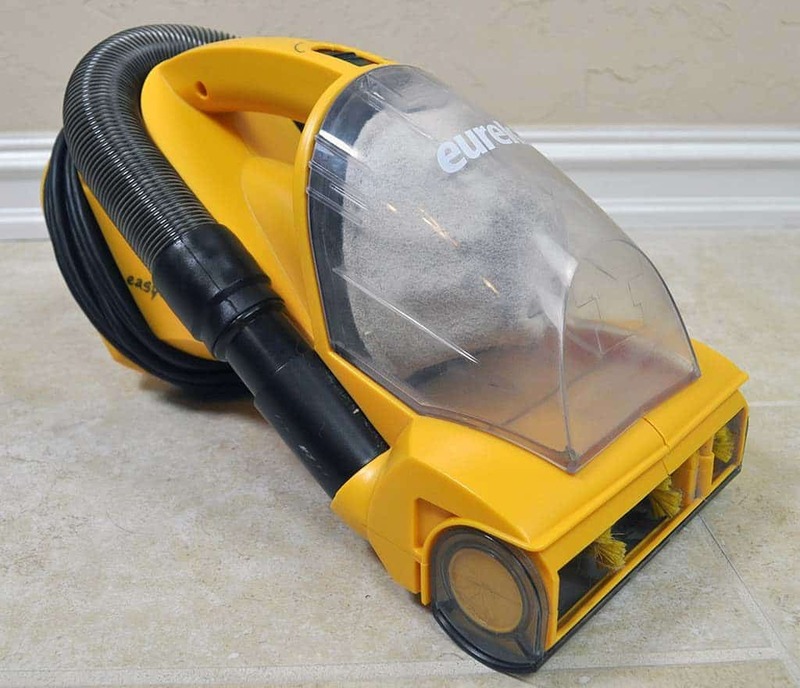 Each of the Eureka handheld vacuums are named EasyClean, with the exception of the older RapidClean model (which seems to be in the process of being discontinued). When it comes to variety, Black & Decker knows just how to separate themselves. With a total of 68 different handheld models, Black & Decker is no stranger to creating options for users. Whether you want an expensive, top of the line handheld or just a basic, no bells and whistles style handheld, they have an option for you. Although Black & Decker has 68 different models, this does not mean they are all completely different. For the most part, it seems that they have about 20 different models with several color schemes and vacuum packages added to the mix. For example, some of their packages come with an extra filter. This does not change the functionality of that specific model, but instead adds value to the overall purchase. Regardless of whether or not you like the idea of a handheld vacuum, Black and Decker is a company worth exploring. With so many different handheld vacuums offered by Dirt Devil, Modern Castle will work hard to provide clarity around a majority of these units. Each one of the Dyson units provide a self explanatory name, giving users the ability to purchase a vacuum designed for a user’s needs and preferences. Perhaps the most significant difference is a corded vs. cordless handheld vacuum cleaner. There are pros and cons to both options. The most notable comes down to convenience. With a cordless handheld you can simply grab the vacuum and take it anywhere. However, you are limited by the size of the battery and in some cases the battery may not be able to create as much power and suction as a corded AC power unit. The battery limitation in terms of power duration is a bit overblown, in my opinion, as most messes that you would tackle with a handheld vacuum cleaner can be cleaned up in a matter of minutes. Most times this is well within the power duration of virtually every handheld vacuum cleaner. A longer and pliable cord can add a degree of convenience to a more traditional corded handheld, but it is still unlikely to be as easy as a cordless. Ultimately, it’s a choice between convenience (cordless) vs. power (corded). There are no shortage of specific uses for handheld vacuum cleaners. However, one popular scheme are those designed to tackle pet hair. If you have dogs, cats, or other pets that shed hair, a handheld vacuum that’s designed to eradicate pet hair can be a nice addition to your primary vacuum cleaner. Most vacuum cleaners simply don’t have the right tool or sufficient suction to deal with pet hair, especially pet hair that is matted into carpet, couches, or other upholstery. Bissell’s Pet Hair Eraser and other pet hair handheld vacuums do a great job of providing the right tools to help pull embedded hair from the carpet, up towards the surface where it can be suctioned into the unit. Wet dry vacuums are designed to handle both dry and wet messes. As a result, these can be good multi-purpose handheld vacuums as well. While these are not likely going to be strong enough to handle messes at the same caliber that a full size wet dry vacuum or shop vacuum could, they can handle the smaller and medium sized wet messes. With each of these handhelds in mind, handheld vacuum cleaners have a place in the cleaning arsenal for most homes. Not every spill is a massive one that requires a large vacuum. Therefore, handheld vacuums come into play with their ability to be easily removed from storage and put into action. How Do Handheld Vacuums Work? Handheld vacuums come in a multitude of shapes and sizes and can comes as part of an upright (as with the Electrolux Ergorapido), stick, or just its own unit. This style of vacuum cleaner can be used to get into those hard to reach spaces, clean between couch cushions, spruce up your stairs, or any other small, “quick fix” kind of mess. As a smaller unit, handheld vacuums are often easier to carry around, increasing the degree at which you can maneuver to clean up. With a smaller nozzle, this style of vacuum is not necessarily designed to clean up larger messes. Time is always of the essence and handheld vacuums will certainly take longer to clean up a big spill as compared to your larger, primary upright or stick vacuum. Yet, small messes fall right into the sweet spot for handheld vacuums. A small motor is usually built into the base of the unit. This motor is able to power a hose, brushroll, suction nozzle, or all of the above if each is offered. Brushrolls are more than likely going to provide the widest cleaning path when using a handheld vacuum cleaner, but the hose or suction nozzle may offer a more powerful degree of suction. Regardless, most handheld units are able to be put into action quickly, due to their smaller, easier to store builds. For the most part, using a handheld is quite simple. There tends to be very little setup. Just unbox, plug in or charge it, and get to cleaning. By testing a variety of handhelds, we want to provide the very best information possible as well as clarity among which handheld vacuums are right for you and your cleaning needs. Still not sure which handheld vacuum is the best choice for you? Please send us an email via our contact form. We’d be happy to help!